CES is around the corner and we are already evidenced with some products that are going to be unveiled at the event. Along with the Iconia family tablets, Acer has launched an All-in-one computer ahead of the event. Called as Acer TA272 HUL, this all-in-one PC is already shipping around the world. It has a massive 27-inch screen that offers a 2560 x 1440 resolution, which is four times sharper than convenient high-definition monitors, according to the company. The cherry on the cake is the touch screen. Yes, Acer TA272 all-in-one PC includes a 10-point touch screen so you can easily access anything by just tapping on the screen. What sets it apart from other all-in-one computer is its internals. Unlike other AIO’s, Acer TA272 HUL is not powered by Intel processor and doesn’t run Windows. This system is powered by Nvidia Tegra 4 quad-core processor and 2GB RAM. It is equipped with 16GB of internal storage and comes with 2MP webcam on the front side of the monitor accompanied with two front facing Dolby surround sound certified speakers. This massive 27-inch all-in-one computer is runs Android 4.2 Jelly Bean. This is the first time an all-in-one computer is running Android instead of Windows. We are surprised to see Acer installing Android 4.2 on the system when Android 4.3 and Android 4.4 already available for certification. The monitor can be tilted from 30 degrees to 80 degrees depending on your preferred viewing angle. There is a USB 3.0 port to connect your peripherals, game controllers and other accessories. In addition to this, there is a HDMI port and a DisplayPort connection, this means that it can act as a 27-inch external display for your desktop or laptop. Acer TA272 HUL is certified to run Windows 8 as well. 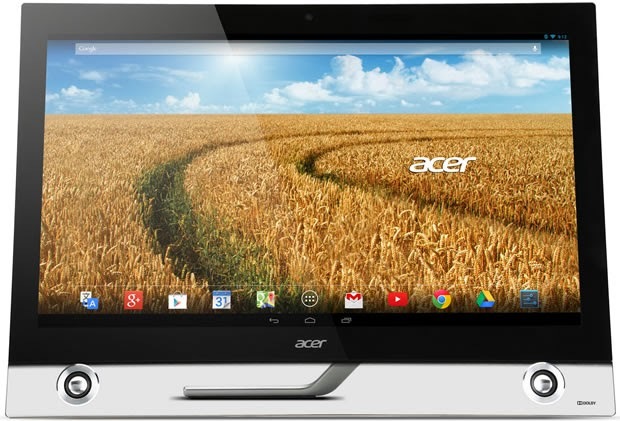 Acer TA272 HUL is available for $1099 at Acer’s online store or at third-party retailers as well.